Does anybody else stuggle with shabby-chic or distressed types of cards? There are some amazing designers and card makers out there (Betsy Veldman comes immediately to mind) that have turned this style into an art from. Sigh...their work is so lovely. On the other hand, I really struggle with this style. I don't know--it's something about the ink distressing or the multiple DP layers, or maybe the multiple details that always comes out, well, wonky. Nonetheless, I wanted to try making a card using this style again (remember--practice makes perfect?) and here's what I came up with. I was going for a sort of "Grandma's kitchen" kind of look so I started with a couple of design papers﻿ that reminded me of old fashioned kitchen designs. I layered them on a piece of Scarlet Jewel cardstock, then diecut a scalloped circle in green designer paper and attached it where to other two papers met. To cover the seam, I added a ribbon in Itty Bitty Dots Scarlet Jewel. The focal point was made by stamping the flowers, stems and sentiment on a piece of cream cardstock. Because the designer papers had a slightly distressed look to them, I distressed the edges of the focal with Chai ink. I then layered the cream piece with a piece of the stripped DP and attached it to the card front. Have you practiced a technique or style that's been giving you fits lately. Whatcha' waiting for? Go ahead, you can do it! The pearls are just right! Finally checked my gmail today. thanks for your kind message. We are related, indeed. This card is great--I pinned it on my pinterest.com page. I'd say this nails the "Grandma's Kitchen" feeling perfectly. 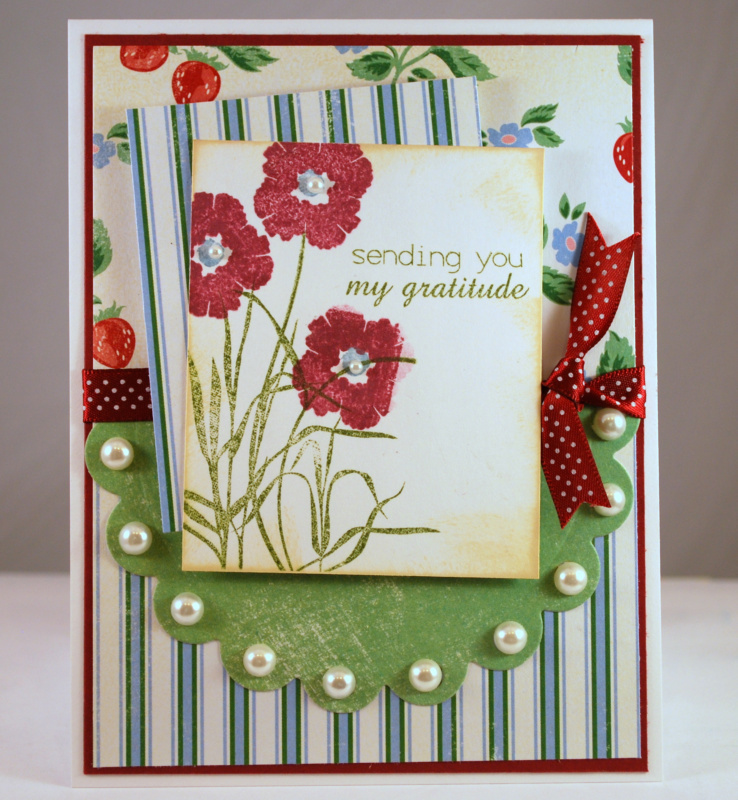 It's beautiful as is the other card sample you made for the OWH Midweek throwdown... which is what brought me over for a blog visit. I love vintage and shabby chic and I believe you have mastered shabby-chic! It is such an eye pleasing card and also love the pearls.